Explore the wealth of posted material related to the Beck Protocol and the Brain Tuner. Also discover articles and books about Bob Beck, transcripts of audios and videos featuring Bob, as well as articles and handbooks written by Bob. If you want to better understand the electrical nature of our bodies, Electricity for Health in the 21st Century will take you on a fascinating journey through the body and the history of electromedicine. Gain an appreciation for the pioneers who unraveled the secrets of our electrical nature, discovering the body's natural ability to regain health. Walk with the author as she discovers how products and foods either enhance or inhibit our electrical systems and our health. This booklet helps the reader discover how our bodies function electrically—in simple, easy-to-understand language. A section is devoted to research that helps to explain twelve ways the Beck units assist in restoring health. 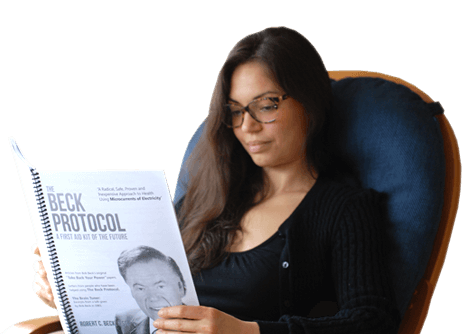 This Guide offers step-by-step instructions on how to use each of the four parts of the Beck Protocol…how often, how long, what to expect, and more. This Guide also offers suggestions for a more intensive program of use as well as providing insights gained by experience with the Protocol. This 1983 lecture by Bob Beck was given when he launched the Brain Tuner. Bob tells the story of how the Brain Tuner came to be and how it works. He also provides insight about people who were involved in cranial electrotherapy stimulation (CES) research in earlier years. The amazing reach and variety of Bob Beck’s work and accomplishments are featured in this short biography and synopsis of his achievements.